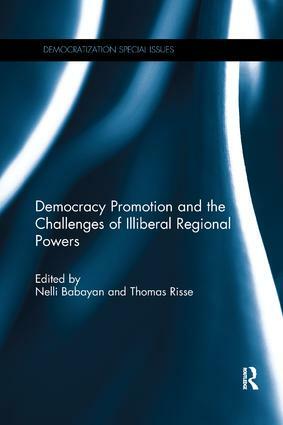 This book examines Western efforts at democracy promotion, reactions by illiberal challengers and regional powers, and political and societal conditions in target states. It is argued that Western powers are not unequivocally committed to the promotion of democracy and human rights, while non-democratic regional powers cannot simply be described as "autocracy supporters". This volume examines in detail the challenges by three illiberal regional powers —　China, Russia　and Saudi Arabia　— to Western (US and　EU) efforts at democracy promotion. The contributions specifically analyze their actions in Ethiopia and Angola in the case of China, Georgia and Ukraine in the case of Russia, and Tunisia in the case of Saudi Arabia. Democratic powers such as the US or the EU usually prefer stability over human rights and democracy. If democratic movements threaten stability in a region, neither the US nor the EU supports them. As to illiberal powers, they are generally not that different from their democratic counterparts. They also prefer stability over turmoil. Neither Russia　nor China　nor Saudi Arabia explicitly promote autocracy. Instead, they seek to suppress democratic movements in their periphery the minute these groups threaten their security interests or are perceived to endanger their regime survival. This was previously published as a special issue of Democratization. Democratization – an externally-driven or a home-made process? The effects of Russia’s response: spoiling or unintentionally favouring democratization?